Baby fever is running wild lately within my circle of friends and so are the baby showers. When it comes to giving baby shower gifts, I love to team up with another friend to create custom gift baskets. They are complete with baby necessities with a few fun extras. I used a Silhouette Cameo to make custom name vinyl designs for the baby shower gift baskets. The best part of making baskets – no gift wrapping necessary! (I am gift wrapping challenged). This last basket I made with the scraps I had left from the vinyl. I gave this to his mom empty, but told her to fill free to use it however she pleased. Could make a great bath time toy bucket. 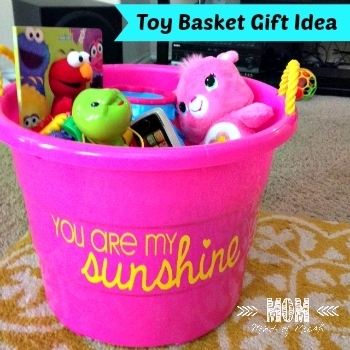 Have fun creating your own baby shower gift basket! It’s a win-win for both mom and baby. Mom uses the basket; baby enjoys what’s inside. And, it’s fun for you to pick all the fun goodies inside. Gift baskets come in handy for any occasion. *Post contains affiliate links. Purchasing through them help support this blog. What a cute idea! I am totally in the baby shower stage of my life, I can’t wait to put something like this together. Great ideas !Thank you for linking up to the Bloggers Brags Pinterest Party. I have pinned your post to the Bloggers Brags Pinterest Board.Would love to see you again next Monday.